What is Extreme Heat? Temperatures that hover 10 degrees or more above the average high temperature for that area and last for several weeks are considered “extreme heat” or a heat wave. Humid and muggy conditions can make these high temperatures even more unbearable. Really dry and hot conditions can cause dust storms and low visibility. Droughts occur when a long period passes without enough rainfall. A heat wave combined with a drought is a very dangerous situation! Doing too much on a hot day, spending too much time in the sun or staying too long in an overheated place can cause heat-related illnesses. Know the symptoms of heat illnesses and be ready to give first aid treatment. 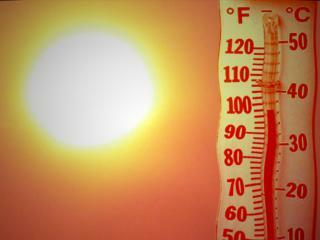 There are two major types of heat illness – HEAT EXHAUSTION and HEAT STROKE. If heat exhaustion is left untreated it can lead to heat stroke. Both conditions are serious, however, heat stroke is a major medical emergency and getting victim’s body temperature cooled down is more critical than getting fluids in their body. Heat stroke can lead to death. Get victim to a cool or shady place and rest. Lightly stretch or massage muscles to relieve cramps. Loosen clothing around waist and neck to improve circulation and remove sweaty clothes. Cool down victim’s body – put wet cloths on victim’s face, neck and skin and keep adding cool water to cloth… or if outdoors, use hose or stream. Also, fan the victim or get inside air-conditioned place. Call for an ambulance or call 9-1-1. Put victim on their side to keep airway open. Keep cooling down their body by placing ice or cold cloths on wrists, neck, armpits, and groin area (where leg meets the hip) or keep adding water to cloths. Also fan the victim. Check victim’s ABCs… Airway, Breathing, & Circulation. Stay with victim until medical help arrives. Remember, HEAT STROKE (a.k.a sunstroke) is a medical emergency and can cause the victim to slip into a coma — getting a victim’s body temperature cooled down is more important than getting fluids in their body! You are currently browsing the Fedhealth blog blog archives for July, 2015.